Departing daily from Las Vegas, this tour will take you to the world famous Antelope Canyon and Horseshoe Bend where you can experience the colorful canyon that offers amazing photo opportunities. You will begin your excursion with a complimentary pickup from your select Las Vegas hotel by 6am, and the drive to Page, Arizona will be approximately 4.5 hours. This guided scenic tour from Las Vegas to Page includes the Virgin River Gorge, Lake Powell and the Glen Canyon Dam, all visible from the motor coach and you hill have ample time to explore Antelope Canyon and Horseshoe Bend on foot. There is an optional scenic helicopter flight option that features Horseshoe Bend, Glen Canyon and Lake Powell. This full day tour will last approximately 13 hours. Lunch will be provided as well as bottled water. Enjoy a day away from the city of Las Vegas on this tour to the stunning Antelope Canyon and Horseshoe Bend. Departing at approximately 6am, you will be driven by air-conditioned coach to your destinations. Once in Page, Arizona, you will experience both Antelope Canyon and Horseshoe Bend Overlook. The specific order of these activities may change from day to day. 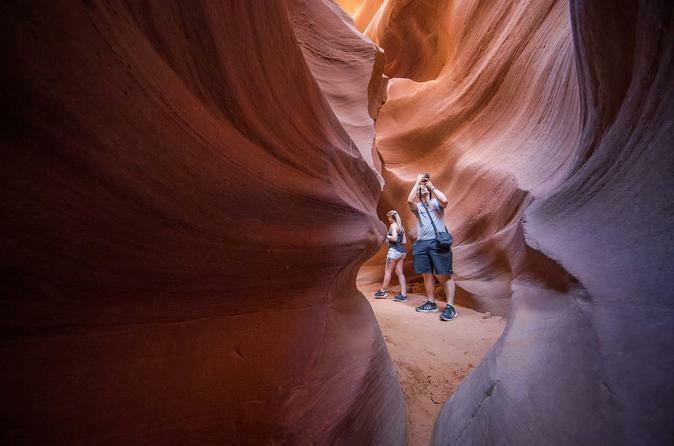 Your Antelope Canyon tour offers a scenic walk in a sculpted sandstone canyon with towering orange, red and pink walls. The walkable canyon floor is sand, and there are numerous amazing photo opportunities and the native Navajo guides will share some history and culture of the area. This portion of the tour is approximately 75 minutes in duration. Horseshoe Bend Overlook requires a 1.5 mile (2.4km) round trip walk over sand and rocks. You will reach a 1,000 foot canyon as you look down upon the Colorado River in the bottom of Glen Canyon. Guests can walk around the arched rim of the canyon for their own photo spots of the canyon and the river. Page, Arizona is at a higher elevation than Las Vegas, which makes it about 4-5 degrees cooler than Las Vegas on any given day. It is also possible to have heavy rains in Page, as well as snow in the winter. You will spend approximately 3 hours at Page, Antelope Canyon and Horseshoe Bend Scenic Overlook. This guided scenic tour will be given in a full sized motor coach with a restroom on board and individual power outlets for each seat. The tour guide can provide assistance in Mandarin and English. There is also a narration/tour guide app that offers Mandarin and English narration, text, photos and videos during the tour. This app can be downloaded for free on your smartphone, Apple or Android.